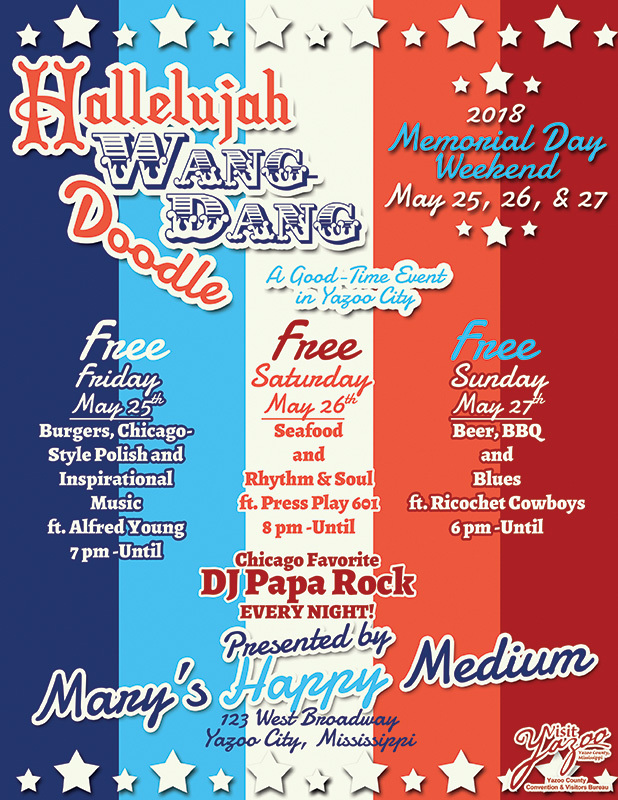 Join Mary’s Happy Medium for the 2nd Hallelujah Wang-Dang Doodle good time on Memorial Day weekend! Live music, Chicago favorite DJ Papa Rock, and FREE FOOD while it lasts! Friday, May 25 – 7 pm – Until – Burgers, Chicago-Style Polish, & Inspirational Music! Music starts at 7 featuring Alfred Young! Saturday, May 26 – 8 pm – Until – Seafood and Rhythm & Soul! Music starts at 9 pm featuring Press Play 601 – Jackson’s #1 Party Band! Sunday, May 27 – 6 pm – Until – Beer, BBQ, & Blues! Live music featuring local favorite Ricochet Cowboys! For more information, visit Mary’s Happy Medium (The Medium) on Facebook. Presented by Mary’s Happy Medium. Sponsored in part by the Yazoo County Convention & Visitors Bureau.